Who doesn’t enjoy eating? In fact, I bet you do it every day. Aside from sleeping, cooking will probably be the most frequent activity in your van. It makes sense to plan a kitchen layout you’re excited to use. 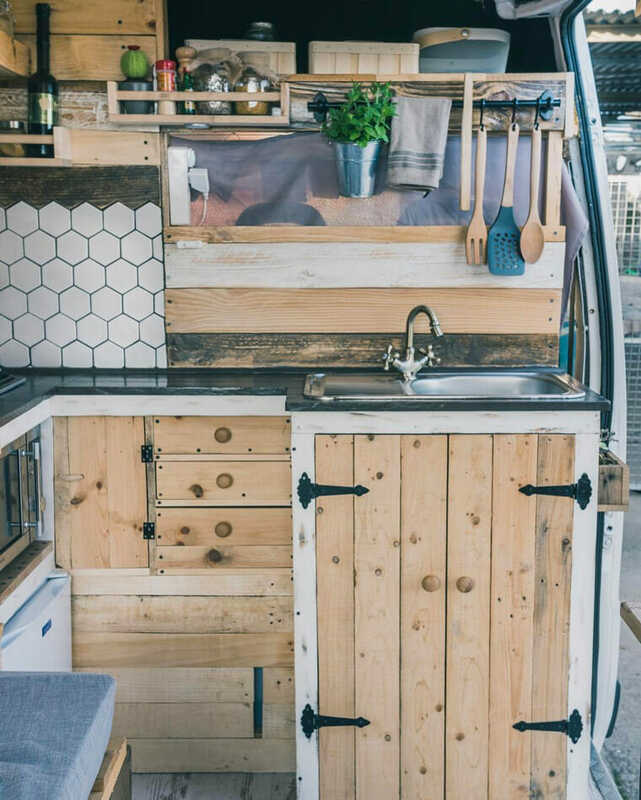 Daydreaming about a future vanlife kitchen setup is fun, but keep in mind not all builds have to be extravagant. In fact, many of the vans pictured here are over-the-top fabulous! When it comes down to it, the main components in most kitchens are keeping food cold (with a cooler or refrigerator) and heating food up (with a practical fuel source). Even these items can be compromised. That being said… who doesn’t want to dream!? Laia and Aitor travel through Portugal and Spain in their self-built Peugeot Boxer. We like the sink position of van kitchen. It’s also highly functional packing 70l of water and a hot water tank beneath the sink. You can check out more photos of their build on @thevaneffect. Betsy and Jusint from @wandering.woods roll around in a self-converted sprinter van. They’ve travelled to over 45 countries in this vehicle. Our favorite thing about this build is the feel provided by the window. They have managed to pack everything from a sink to an oven in a full kitchen setup. The oven is a camp chef deluxe that heats up food with propane fuel. If you are willing to block off the cabin from the living area like @theserollinghills did, you can make lots of counter space. Matt and Liv have an electric water pump sink with storage space underneath to fit a cooler for cold food. This 2012 Renault Master by @glamervanlucy has an eco-friendly tiny kitchen built in. They have an induction cooktop when hooked up to shore power, and a gas stove for off-grid camping. Their side-door refrigerator packs in the food, and they love their coffee! Every morning it is made off solar power using a Nespresso Creatista Plus. @theambitiousblonde has a really modern interior built by @bwcdenver. This is built into a Mercedes Sprinter and is jam-packed with storage and runs entirely off solar power. We like the attention to detail in the cabinets’ wood grain. @kimmexplores has a homey and rustic kitchen with plenty of space to keep food and accessories. 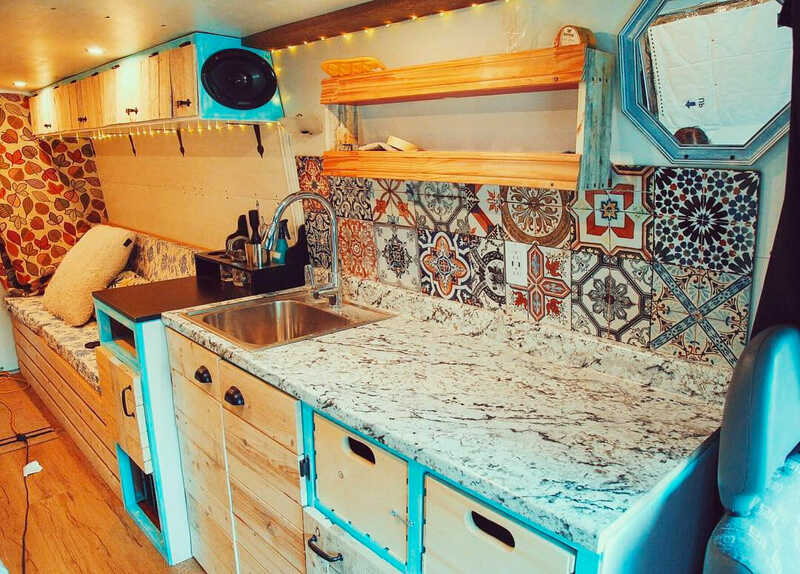 This is a 2003 VW LT35 with a cool backsplash reclaimed wood interior. @livingbythemile has a super creative kitchen setup with cool graphics and all the bell and whistles. We love the way they were able to store the spices and towels off the counter but still within reach. The cook on a portable propane stove that can be brought indoors or outdoors. This is another van build that utilized the space between the cab and living area. @camperdreamin built out their Opel to include a Waeco CRX80 fridge and propane stovetop. Sydney from @divineontheroad built out a 2011 144″ Mercedes Sprinter. She keeps two induction stoves inside that run off solar power and a magic chef mini fridge for maximum cooking capacity. The magnetic knife holders and backsplash are two of the things that drew us to this build. @van.surf.climb is another Mercedes Sprinter with a practical kitchen setup. The small propane stove leaves extra space for preparation and the organization of spices and knives keeps things tidy. 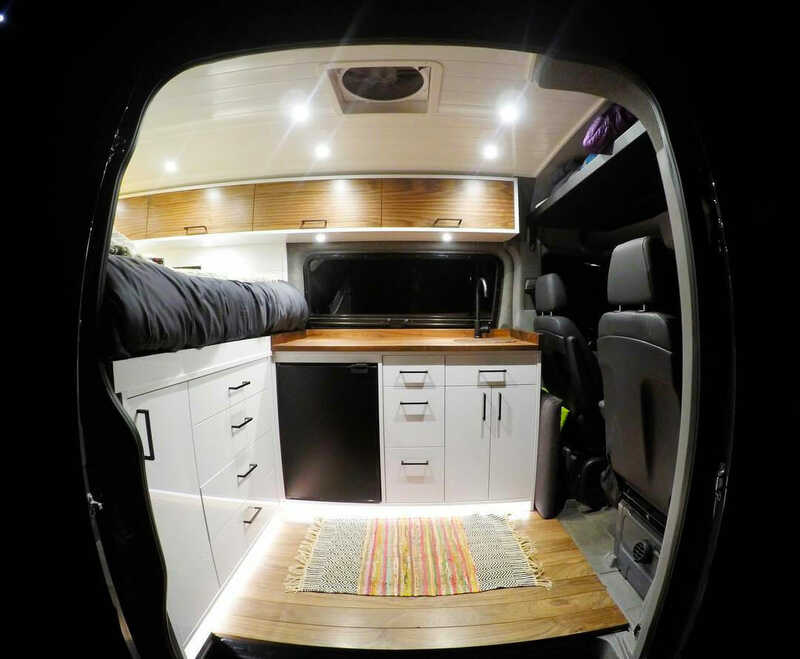 @noel_russ has a gorgeous van build with wood floors and cool grey cabinets. The left side of the countertop opens up hiding a top-open refrigerator underneath. There’s also a propane powered camp chef stove/oven combo and sink opposite the cutting board. Craig and Hannah are from Europe and document their travel on @_lifeinthesimplelane_. They’ve made good use of space in their LDV Convoy. We like the solid wood setup complete with stovetop, refrigerator and a huge pantry! Haylie and Andrew from @adventuringtwo built a clean and simplistic kitchen setup in their Mercedes. The shelving on top is a great way to save counter space while traveling around Australia. They also built a vent fan right over the kitchen area for perfect ventilation while cooking. @dont_know_road has a cool pop of color in this sprinter van conversion. We like the backsplash and vibrance of the counters. They cook on a portable propane Coleman portable stovetop which can be used indoors and out. 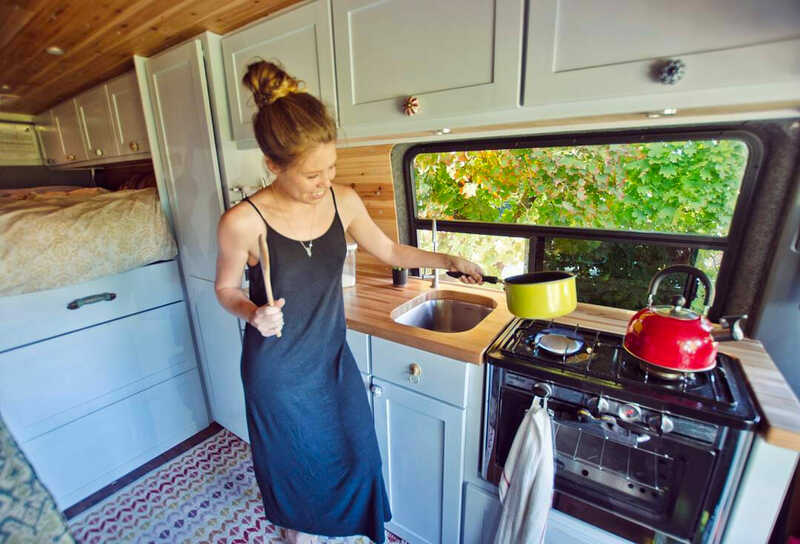 @roaminginavan has an epic looking flat, modern kitchen built into a Ford Transit. This was built out by freedomvans and one of our favorite features are the decorative ventilation over the refrigerator and lighting under the shelves. @three_vanlifers from France like to cook with the outdoors in mind. This Opel van has a small refrigerator and a portable stove where they use an Omnia oven to cook cakes and bread! It’s important (and fun!) to remember that cooking doesn’t always have to occur in the confines of a van. 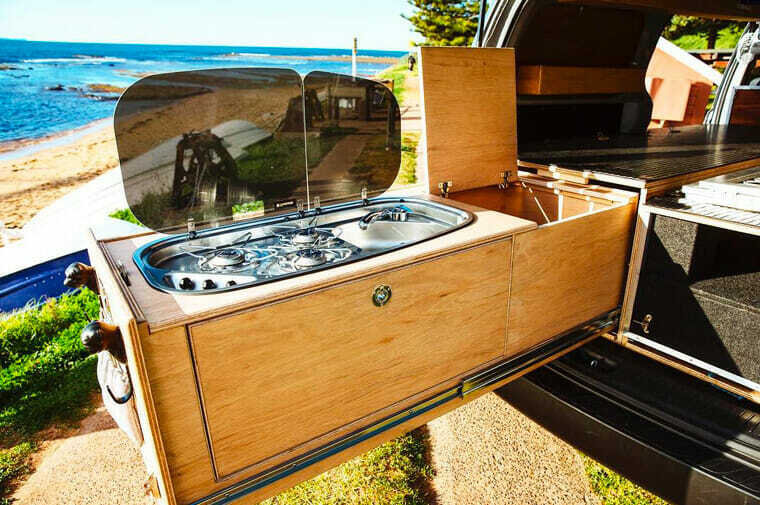 The next few vanlifers, like @t4_ole have come up with creative and portable solutions to bring the kitchen outside. In this van build, a swinging cabinet opens up giving extra storage space and access to the Dometic refrigerator inside. @peteramend has a similar build with drawers that slide out the back for a lot of cutting and cooking room. She uses a portable propane stovetop which is perfect for the outdoors. @vango_fitouts has built a number of vans in Sydney, Australia with unique kitchen setups. This one has a slide-out drawer with a Dometic 3 burner stove installed. Another build from @vango_fitouts shows a slide-out kitchen setup with a portable propane stove for cooking. We like the idea of spending more time out in nature, especially if you are living the van life in a place with lots of sun! We hope these ideas inspire you to come up with some cool kitchen setups of your own. If you have a unique buildout to share send us your pics and they may be featured!